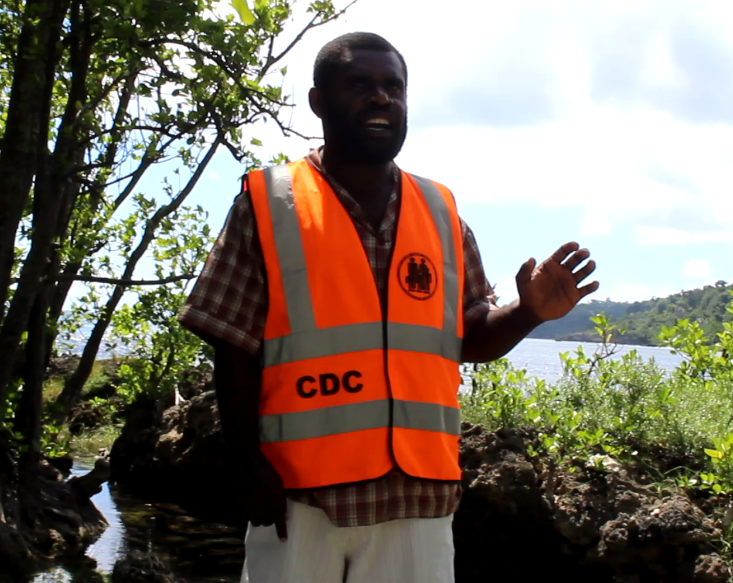 From the 3rd to the 6th of April, Vanuatu’s first disaster risk reduction (DRR) camp organized by the Red Cross and National Disaster Management Office (NDMO) took place in North Tanna. Over the course of three days, 31 participants (4 women, 27 men) took part in training, debates, and movie nights around DRR. “The personnel handling the camp, including myself, were impressed. People were involved in the camp’s daily life, had good ideas on both preparedness and response measures, and they were very enthusiastic,” says Isabelle Choutet, DRR Project Manager for Vanuatu Red Cross Society (VRCS) and French Red Cross (FRC) North Tanna Recovery project after cyclone PAM, implemented in partnership with the NDMO. Volunteers were trained in awareness sessions on hazards, community response planning, evacuation planning, and many others, in addition to the knowledge they gained the prior year. This boot camp was designed as a Training of Trainers for Community Disaster and Climate Change Committee (CDCCC) chairmen and awareness focal points to be able to develop their Community Response Plan (CRP) with the support of the DRR Red Cross team. The aim was to empower them and to strengthen their position as leaders in the frame of CRP development process. The choice of organizing a camp and not a formal workshop or training was motivated by the intention of creating strong links between CDCCC members in North Tanna. Participants practiced their communication, coordination and leadership skills, which are crucial in times of disaster. Indeed, each participant had a role in the “micro-society” that constituted the camp: to be responsible for the wood, the fire, water, to set up shelters, etc. Participants had to listen to each other and to work together. Before the camp, a meeting took place in NDMO provincial office with training participants and the Provincial Disaster Officer (PDO). It was the first time CDCCC members entered NDMO provincial office for a meeting since its opening. It was an opportunity to meet with the PDO and to conduct a short refresher session on NDMO structures, disaster actors in Vanuatu and their roles and responsibilities. As the camp drew to a close, participants were presented with the upcoming activities to take place under the shelter component of the project: awareness sessions on build back better/build back safer construction techniques and construction of nima’entens (local traditional refuge in case of cyclone). They also agreed on a 3-month plan for DRR activities to be conducted with communities in North Tanna. *I learned how to pass on information to my community. We have to make sure every household builds a safe house and that everyone understands the three cyclone alerts disseminated through the radio when a cyclone approaches. Another piece of advice I wish to give community members: the community must work together with CDCCC to avoid a disaster in Hebron area.